Someone who posted on Yael Abouhalkah’s Facebook site today described KCI as something that looks like the Soviet Union would have built 40 years ago. Nice! I think this whole thing is a pipe dream and I do hope it gets Kansas City leaders motivated to act fast because from what I am hearing, some very serious thought has been put into this Johnson County initiative. One thing about this is you can’t put too much blame on Kansas City leaders. After a poor start, Sly James laid the groundwork for a new terminal very carefully, with his appointment of a blue-ribbon commission and its year-long investigation. Problem was when they went to survey residents, the vast majority indicated disapproval, so James wisely put it on the shelf. It would have been very difficult to forge ahead with an election in the face of terrible numbers. This Brownback deal could well change people’s perception, however. I really don’t understand it…having friends, family, and business acquaintances all state their disdain for KCI…the city has to be living under a rock (they certainly aren’t traveling!) to not recognize the importance here. I’ve been to many an airport, and so have my kids…they often comment about how miserable KCI is and such a poor reflection on an otherwise incredible city. I’m not even talking about huge city airports, either…we lag FAR behind Baltimore, Denver, Philly, Orlando, Ft Lauderdale, Indy, Nashville, and Memphis…just to name a few wherein city size isn’t all that different from here. Get on with it, folks!!! Of course, getting an airport in Johnson County might be a bit handier for me. Right on target, Lisa…I hope some of our readers heed your pep talk. There is still a huge amount of unoccupied ground at the southern portion of the Sunflower Army Ammunition Plant. That’s the first thing I thought of when I read the headline. MCI is still on my back, back burner; it is sufficient unto the day. Sure, renovate/update the facility, but do not pour $1-2 billion into said facility in order to make it “world class”, if only to prevent travelers from comparing it to our decidedly “Midwestern class” city. Moreover, despite what any cheerleader says, the monies spent to create a 1 terminal solution would be stolen from our pockets through new ‘usage’ fees. And that’s on top of the nearly $1 billion ask the city wants in order to complete basic services. And that’s on top of the perpetually rising water/sewage fees needed to pay for the mufti-billion dollar EPA mandate. We pay what? 10 – 11% of our income in local taxes now and receive what? Diddly. Oh, I’m sorry: We have those lovely steel plates. Spending money on another vanity project while debasing our current tax infrastructure through TIFs sounds like idiocy to me. I understand all except “putative”…KCPS….”stolen from our pockets”…and “nearly $1 billion ask” (which is actually $800 million, that is, 20 percent less than $1 billion). You sound like you and your cart are bogged down in a remote aisle in WalMart. KCPS has been preparing a new ask for over a year, however the recognize the taxpayers are “not in a mood” and so have put it off. But due to the influx of students into the KC area (through mostly charter schools), the available money –which so far has stayed the same (we’ll see if Greitens pulls the trigger on K-8 cuts)– is being sliced up into smaller and smaller pieces of the pie. Where an ADA of $8,400 (for example) per pupil was considered norm, that figure now looks more like $8,000 and looking to go lower. At some point KCPS will behave to ask for an assessment increase. And, no, it’s not covered by the Star and won’t be until the last minute. As to the “stolen for our pockets”, that means what it means; the city would have us believe the airlines will pay for all of this, which is a flat out lie. The monies spent will be recouped from the pockets of local airport users through new fees every time they fly in or out, regardless of our lack of desire to waste the cash on a redesign. As per your 20% remark, do you honestly think we’ll be able to receive $800 million in GO bonds without interest? I would expect the final number to be much nearer to $1 bn than not. As for the Walmart gibe…don’t know what to say: I do my best thinking in Walmart’s aisles. With, of course, my tinfoil hat securely in place. This whole thing is about image, public relations, marketing, businesses making some big bucks and dangling a shiny new thing in front of citizens so they can feel better about their town. If ordinary people want to hang on to the argument about convenience, let ’em — it makes the most sense when it comes to spending billions of dollars. There are more important challenges, people. As one who lives near KCI (close enough to hear the jet roar taking off when the wind is out the north), I had to laugh when I read the Star story (which I had to do online as the main section was missing from my delivered paper). When I had my house built 20 years ago, I had to sign a legal paper provided by the City of Kansas City stating that I acknowledged the noise levels from KCI and that I accepted that as part of owning the house and the property on which it sits. I’ve improved on the as-built condition of the house with additional sound proofing, however you can still hear the dull roar with the north wind. And if you are out in the yard, you hear them nearly all the time if they are taking off to the south. I doubt individuals surrounding any of the airports in Johnson County have signed such an agreement, and even if they did, they would easily contest in court that they never agreed to having jetliners come in low over their houses for landing at any Johnson County site. For sound proofing or buyouts of property, I could easily see costs of tens or even hundreds of millions and that is before any construction could even start. The legal cases would go on for years. And as sometimes happens here, some pilot decides to turn out of the normal take-off pattern and turn directly east over our subdivision which makes a loud wake-up call. You think the Johnson County crowd would stand for that? I’ve been to the new Denver airport. It was built in the middle of nowhere and they didn’t have to contend with residents nearby complaining about noise in the permit and building process. It’s a long haul to anywhere from the airport. So comparing a timeline of planning and construction like the Star did is not doing apples to apples because any Johnson County proposal would not be in the middle of nowhere. People also forget that Denver lost one of it’s hub airlines in the move from Stapleton to DIA because of the increased cost and airfares took an accordingly big bump at the new airport. I lived in the KC area for a long time now. One thing that I’ve observed is that, with the exception of Union Station, Johnson County never pays for any metropolitan amenity. It’s up to the other areas in the metro to do so. I still occasionally read Johnson County people still complaining about contributing to the Union Station renovation and that tax ended nearly 15 years ago now! Sam Brownback’s legacy is going to be how he nearly bankrupted the State of Kansas, This whole thing is just a diversion from the real problems they have west of the state line. It ought to be breathtaking; Feddie and the Dreamers pegged original construction costs at $1.5 bn, but by the time DIA was finally built that had ballooned to nearly $4 bn. How much for the MCI 1 terminal solution again? I trust, Will, you’re not suggesting it wasn’t worth the $4 billion???? For a local comparison, back in 1967, Jackson County asked voters to approve $100 million for a new sports complex waaaay out on I-70. Voters approved by the narrowest of margins. (The bond issue required a two-thirds majority.) The entire Kansas City area has been reaping the benefits ever since, and we would not be the city we are today without that great complex. What I’m talking about here, of course, is thinking ahead and daring to think big. That’s what I mean about the WalMart complex; if big-city governments are constantly looking for bargain-basement prices, they are not going to keep pace with competing cities that do think big. There are a few things you have to do to keep pace: a good sports complex, great arena, modern performing arts center, bustling downtown and…a first-class airport. We qualify on every front except, of course, the last. Apples and stale bread, Fitz. DIA brings in 53 mil passengers a year (only 29 million more that KC does, according to our Mayor) because of the mountains and the myriad of attractions/entertainments they afford year round. And you’re telling me tourists will fly into and out of a revamped MCI in the same numbers why? To drive their rental down to see The Precious Moments Chapel? Or perhaps to scoot up to St. Jo to peer at the James brothers’ old homestead? Seriously? Kansas City is not in a competition with Denver, not even close, and spending billions we don’t have to build a new airport won’t make it so. If you don’t build it, you can’t steal from it. That said, I don’t think all the well-heeled folks in Leawood and Stilwell would appreciate being in the flight path of a new airport, so my money is on the distraction theory. After all, they’re still busy looting King Louie down there, they won’t need another trough to loot for at least a little while. I repeat, there’s a lot of unused ground at the former Sunflower Army Ordnance Plant, no neighbor to object to the noise or congestion, and you’ll probably hear no complaints from the folks buried at the Prairie Center Cemetery, within a couple of miles of the Douglas County Line. That’s starting from absolute scratch, though, Peg. And while it might be a great site, the cost of building — building everything — would be astronomical. Seems like a heckuva commute. Would it be farther for a northlander than it is for a JoCo-er to KCI now? It’s a heck of a long way from Olathe to KCI now, but after reading Bill Hirt’s comment, at least we don’t have to put up with the noise. Yeah, western Johnson County would add some distance, but on the other hand would appeal greatly to Lawrence residents. My subdivision is about 12,000 feet or a little over 2 miles southeast of the eastern most north-south runway. The pattern that aircraft are supposed to take is west of our subdivisions and in the cone on the legal document that depicts the maximum noise. On take-off, they are supposed to climb and then make their turns over the Missouri River between Parkville and I-435 to minimize noise impact. This area is also rather sparsely populated. There is a grade school in the Park Hill district close to the take off pattern, but no houses within a few blocks. This because the land near and west of the school in Kansas City on the north side of Barry Road is zoned so houses can not be built there. It’s either farm or commercial/warehouse zoning. There are houses right under the flight path (my boss from work lived in one – but he was an old pilot and didn’t care), but all of those large houses with acreage are in Platte County, not the City of Kansas City. The airport is currently structured so that they try to use the two north-south runways as much as possible as this allows for dual approaches and dual take-offs. Only if the wind is really strong out of the west or northwest do they use the east-west runway which takes them over Tiffany Greens which has houses that are much more expensive with much more influential people living in them than our subdivision. This also diminishes the arrival rate at the airport, but this is not a really big problem at KCI. A good portion of my work career was spent in aviation weather and aviation traffic, so I have a pretty good base of knowledge to draw from on this. Interesting insight on airport operations at the ground — and immediately above — level, Bill. The unsaid in airport planning is that an airport like KCI runway layout is considered a fairly good case example in safety. It is a good idea to have 1-2 miles of undeveloped land that extends away from a runway in case there is an “incident” (layman term is accident). If you notice at KCI, especially off the south end of the north-south runways, there are cattle grazing and haying of the farm fields. 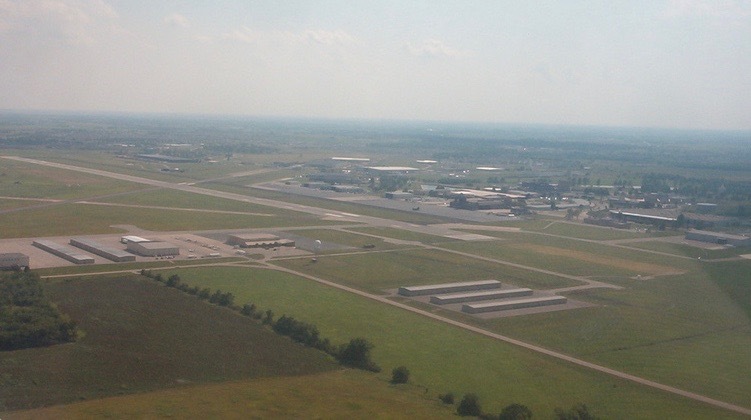 I think it was about 15 years ago that an freighter landed short of the runway at KCI when landing from the south. While the crew was killed, there was no real damage on the ground due to it just being open farm land.This is why airports love having open land off the ends of runways if at all possible. The east-west runway layout at KCI is not quite so ideal. A former TWA captain recently told me of an incident where his co-pilot (who was flying the plane) confused the parking lot lights of the warehouse complex southeast of the east end of the runway with the east-west runway lights and was going to attempt to land in the parking lot until the captain retook control of the plane and went around. This also happened to a U.S. Air flight that was rushing in to try to beat a thunderstorm. They got so low towards the warehouse parking lot before regaining altitude that the landing gear hit the high-tension power lines along I-29 (I saw the power surge at my house when this happened). The pilot then by-passed KCI to fly to Salina to land on the old Air Force Base 10,000 foot runway that was 35 minutes away. The voice recorder loop only kept the last 30 minutes, so the “incident” and attendant discussion was wiped from the voice recorder by the captain’s decision to go to Salina. Unfortunately for the captain, an FAA inspector was riding in the cockpit with them, so the incident was not “forgotten”. If you have ever been to Offutt AFB outside Omaha, you’ll notice that west of the main runway is a long stretch of open land that remains undeveloped to this day. I worked with someone who had been stationed there and he related that at one time the mayor of Bellevue (the actual town Offutt is in) wanted to have that area developed. The mayor was informed in no uncertain terms that if he did, the base would close because they wanted that land to be open in case of an “incident”. This was at the time that Looking Glass and long range recon planes were flying in and out of Offutt. The development proposal was quickly withdrawn. Kansas City owns most of the land within a few miles of the airport for just this reason. And other cities/airport authorities do the same if at all possible. The nightmare scenario bringing large jet traffic into either of the current Johnson County airports is an “incident”. I grew up in the Chicago area and there were two biggies in the 1970s. The first was a United 737 crashing into a neighborhood of houses when descending into Midway on dreary winter day in 1974. There were several people in their houses killed in that one.The second was the American DC-10 crash at O’Hare in 1979 which just missed a trailer park and a bunch of aviation fuel tanks. We are currently on a great stretch of safety in the commercial U.S. aviation community, but eventually there will be another incident that will remind us that having a bunch of development near an airport (especially near the runways) can be a bad idea. You are now our official, resident, aviation expert, Bill…It’s great to have this kind of insight on the blog…Now, how do you feel about a new single terminal? I have mixed feelings. I love the convenience of getting through security. Too many times at bigger airports I’ve waited 30 minutes to an hour to get through a single checkpoint. Atlanta and Washington National are the worst about this (though I should say National has multiple checkpoints which I think any new KCI design should keep). I had a co-worker nearly miss the return home flight with me because she stopped to get a gift for her daughter at National and it took her an hour to get through security. She was running to the gate as the plane boarded. 2. Putting the two airlines with the most flights in one terminal (B) which causes insufficient near terminal parking and creates unnecessary congestion. It’s significant to note that KCI did not get a cell phone waiting lot until after he left (this had been common at other large airports for some time). The rumor around was that van Loh wanted the airport privatized and he wanted to be the big dog running it. Dave Helling hit it right in the Star when he said KCI is a parking concession with an airport attached to it. I also think people advocating a new single terminal or renovated terminals should stop with the “we’ll get a hub” or more international flights. All the airlines that tried hubs here in the 80s into the early 2000s all failed (and there were several – Braniff, Eastern, Midway, Midwest, and Vanguard come to mind). One main reason was the local traffic base is not large enough and is still not large enough. What we have with Southwest now is as close to a hub as we are getting to get in my opinion. The four remaining large airlines are consolidating to fewer and fewer hubs. Look at the impact on the airports at Cincinnati, Cleveland, Memphis Pittsburgh and St. Louis when the hub closed. The reason for a number of amenities and larger terminal went away, but the costs did not. They are struggling with this. Charlotte is on the endangered list. Airlines are consolidating their hubs where there is a large population base that provides a large local customer base. The trend is fly more direct routes between airports bypassing hubs. This is not a good trend for medium sized cities like Kansas City, Indianapolis and the like because these medium sized cities do not usually have a large enough traffic base to support a more than 1 or 2 of these direct flights a day. Also the congestion problems at the big airports are not going away. The FAA is moving towards a new air traffic control system and weather information is better than ever, but as one of my old bosses said, the real answer is “more concrete”. However, the most congested airports are land locked and any expansion has now become prohibitively expensive. Because of this, the trend will be to eventually restrict the use of smaller aircraft using these airports to allow the most passengers per landing to make use of the space. Again this works against medium sized cities like Kansas City because they can not fill a big 757-type 200+ seat plane more than once or twice a day to a destination. Facility and landing costs are important. KCI is a fairly inexpensive airport for airlines to fly in and out of now. A substantial hike in these costs will result in less flights and make the remaining flights more expensive. This happened when Sacramento built their new terminal. Also to think that more shops and food choices at KCI are going to dramatically increase airport revenues should not even be part of the discussion because the impact will be small (I think the city study suggested an increase from around $3.50 now to $5 per person in a new terminal – that is not going to do much in the way of paying off those new bonds). Others have mentioned the lack of mass transit to the airport. It is little known, but the ATA does run a bus route from Crown Center to the airport 17 hours day (route 129), but it is not a very direct way to get there. Many may remember the KCI Express buses that the ATA ran ending in the 90’s that allowed a quick ride to the airport. Light rail to the airport is a costly dream, but I think a bus route patterned along the idea of the MAX routes along Main and Troost could link at least downtown to the airport and provide a viable mass transit option. 1. Airline landing/take off and facility fees will increase. 2. This will cause an increase in airfares – amount to be determined. 3. Parking charges at the airport will likely go up substantially (remember the parking concession with an airport attached observation). I am beginning to lean towards a new terminal, but I need to see more complete accounting of the costs and what the financial impact will be on the all of the users before making a final decision.